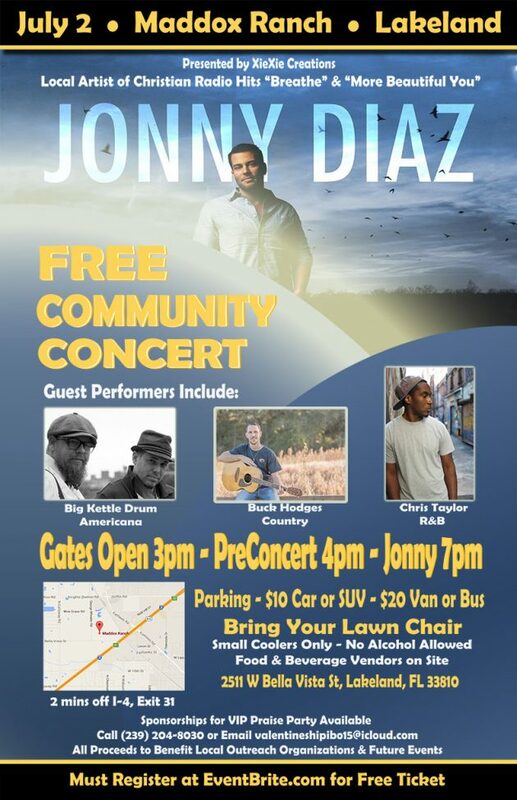 Free Jonny Diaz and Big Kettle Drum Concert announced! Saturday, July 2, 3 p.m.
Jonny Diaz returns to his Lakeland hometown for a FREE concert at Maddox Ranch. He will be playing his biggest hits, including “Just Breathe” and “More Beautiful You.” Jonny will be joined by Big Kettle Drum, Christian R&B artist Chris Taylor and Christian country artist Buck Hodges. All performers are from Lakeland. Local food trucks will be selling food and drinks. Many Polk County outreach and charity programs will be recognized at the show. This event will help future projects, including a Lakeland community garden, trauma treatment facilities, veteran treatment facilities and local charity organizations. Gates open at 3 p.m. opening act starts at 4 p.m. and Jonny’s performance begins at 7 p.m.
Tickets through www.Eventbrite.com are required for entry. Parking will be $10.00 for cars and trucks, and $20.00 for large vans and busses. Come join the local community of faith for a night of praise and fellowship.